David Cameron has defended his decision to call a referendum on the EU - despite the fact it cost him his job. The former prime minister said the issue had been "poisoning" British politics and the Conservative Party - and people were frustrated about it. He described the Brexit vote and Donald Trump's election in the US as a "movement of unhappiness". Mr Cameron quit as prime minister in June after the UK voted by 52% to 48% to leave the European Union. He made the comments in a speech to students at Depauw University in Indiana entitled "The Historic Events of 2016 and Where We Go From Here" . Commenting on the Brexit vote, he said: "I believe and still believe that the fact that we hadn't had a referendum on this issue for 40 years, despite the fact that the European Union was changing ... was actually beginning to poison British politics - it was certainly poisoning politics in my own party. "And I think, more broadly people felt 'well, we have been promised referendums and they haven't been delivered' and people were beginning to feel very frustrated about this issue. "Britain has made its choice - I believe that choice will be carried through. "I think it is right it is carried through and yes, there will be difficulties along the way because it's a big change, but ultimately it can be made to work." Mr Cameron said "populism" had cost him his job and, in a question and answer session following his speech, he said: "So far these three events - the Brexit referendum, the election of President Trump, the referendum in Italy - I'm sure people are going to write about this movement of unhappiness and concern about the state of the world." He said a mixture of economics and cultural arguments had influenced the British and US votes, but in Italy "it's more connected with the euro". How 2016 goes down in history "will depend on what political leaders do next," he said. "If they put their heads in the sand and say: 'Well this will pass and we just carry on the way we are,' then 2016 will be seen as a real watershed. "But if, as I believe will happen, our democracies are flexible enough and our leaders are aware enough, they will correct - 'course correct' as I put it - the problems that they face. "So you will see a greater emphasis on trying to help those who are left behind." But he warned: "If leaders don't take that approach - perhaps particularly in Europe - then it could go down as something quite different." The Daily Telegraph reported that Mr Cameron believed the future euro was hanging in the balance. "I see more trouble ahead," he said. "It is not working as it was intended. "Some countries have seen decades of lost growth. Those countries have a single currency and they don't have a single fiscal system, a fiscal tax system. It creates bigger differences. "You in the United States have ways to make sure that if you have a bad year you pay less in taxes and offset federal programmes. There are no such arrangements in Europe." 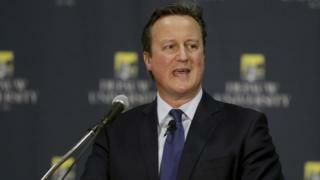 Mr Cameron's speaking engagement at Depauw University - his first since he quit as prime minister in June and resigned as an MP in September - follows a well-worn path of speeches by former UK premiers. Tony Blair gave a speech there in 2008, the year after he resigned as PM, and John Major spoke there in 2001. It is not clear if Mr Cameron was paid for his speech, which came as it emerged his former chancellor George Osborne has earned more than £500,000 from lectures and appearances since being sacked by Theresa May. On Thursday, Mr Cameron tweeted a picture of himself courtside at a US basketball game with ex-president George W Bush - and admitted he was still "a bit baffled" by the rules of the sport, despite seeing a previous game with avid fan President Obama in 2012. Meanwhile, Downing Street has downplayed media reports suggesting the UK is looking for a post-Brexit trade relationship with the EU "somewhere in the middle of the models" enjoyed by Turkey, Norway and Switzerland and is not "particularly interested" in transitional arrangements to cushion the impact of the UK leaving the EU. The comments were reportedly included in a memo produced by a representative of the City of London Corporation, following a meeting with the Brexit Secretary David Davis, according to the Financial Times newspaper. Downing Street said the memo was "an interpretation of a discussion, not a proper account" of the views of Mr Davis and the government.